Customers today demand a fast and seamless experience in accessing financial services when they need it. Industries are rapidly converging and financial services as we know it are no longer a service offered exclusively by banks and insurance companies. The democratisation of technology has fuelled the growth and pervasiveness with consumers expecting similar mobile-related experiences from their service providers. 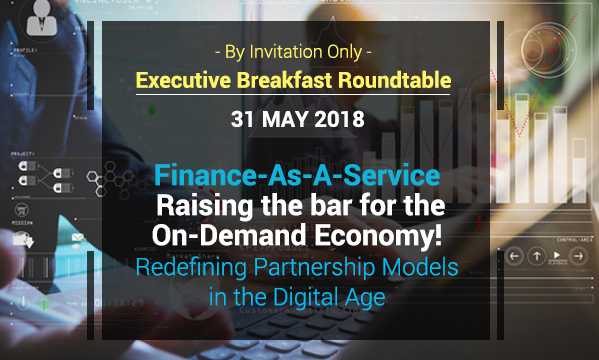 Financial institutions today have to rethink their partnership models and join hands with a greater diversity of organisations to strengthen customer touchpoints and embed financial services deeper into the ecosystem of apps and services that customers interact with regularly. Learn more about how design thinking can be applied to address customer pain-points and create business value by leveraging best-of-breed technologies, as HUGH MASON, an innovation expert and founder of Joyful Frog Digital Innovation (JFDI) Asia shares case studies from his experiences working with start ups and corporations in Asia. Hugh is an entrepreneur with 30 years success leading ventures and building innovation communities around startups and corporations. Hugh helps businesses create scalable processes and metrics to deliver rapid, low-cost business model innovation in a multidisciplinary, multicultural context, managing a team working across multiple countries. ANGUS TORRENS, Executive Vice President of Business Solutions and Delivery, NTT Singapore will also share some brest practices and use-cases on how financial services can be simplified and personalised for the modern-day customer by leveraging mobile, data-connectivity tools and data analytics.